New Delhi, Oct 17 (IANS) India has issued six more medical visas to Pakistani nationals seeking treatment, including two for bone marrow transplants and a five-year-old suffering from eye cancer. “We are giving visa for the bone marrow treatment of your son Mohammed Shayaan Noorwala in India,” External Affairs Minister Sushma Swaraj tweeted on Tuesday in response to a request by Madni Noorwala, who said that his son had undergone bone marrow transplant and needed urgent follow-up treatment. On Monday night, Sushma Swaraj tweeted that a visa was being issued to Shehriyar, son of Saqib Shahzad, for a bone marrow transplant surgery in India. “There is a request for medical visa for 5-year-old child Anamta Farrukh who is suffering from eye cancer for her treatment in India,” she said in a separate tweet. She said she had told the Indian mission to issue medical visa for the child immediately. 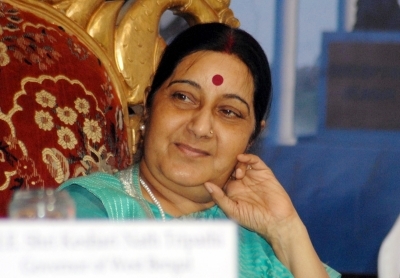 In other tweets, Sushma Swaraj said visas were being issued for the liver transplant surgeries of Baseer Imam Zaidi, Muhammad Riaz and the father of one Hammad Khan. Till now this month, India has issued 13 medical visas to Pakistanis for treatment in India. Last month, India issued a medical visa to a Pakistani child seeking open heart surgery. On Independence Day, the External Affairs Ministry had announced that India would provide medical visas to all bonafide Pakistani patients. As ties between the two countries soured over various issues, the ministry had announced in May that only a letter of recommendation by then Pakistan Prime Minister’s Foreign Affairs Advisor Sartaj Aziz would enable a Pakistani national to get a medical visa for India. The action was termed “highly regrettable” by Islamabad, which said that asking for such a letter violated diplomatic norms and such a requirement had not been prescribed for any other country. However, on July 18, a patient from Pakistan-administered Kashmir, seeking treatment in New Delhi for liver tumour, got a visa. Sushma Swaraj then said that he needed no recommendation from the Pakistani government for a medical visa because the territory “is an integral part of India”.